You have been assigned to lead the ancient monastery and its brewery. Now it’s your time to brew the best beer under God’s blue sky! The fine art of brewing beer demands your best timing. In order to get the best results of your production, you have to provide your cloister’s garden with fertile resources and the right number of monks helping with the harvest. But keep your brewmaster in mind: He is ready and eager to refine each and every one of your barrels! 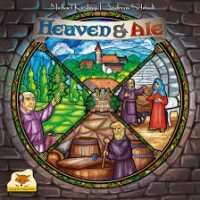 Add a Review for "Heaven and Ale"